It’s tax time again. 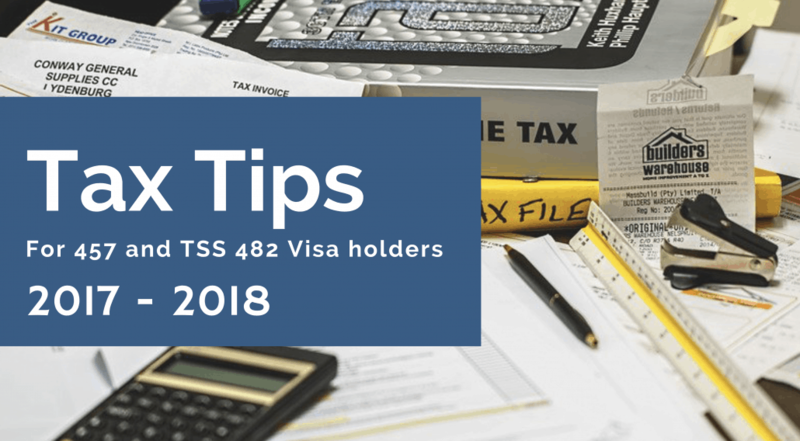 As a 457 or TSS Visa holder, this may be your first tax return. This is our guide to what you can and can’t claim in your 2017-2018 tax return and tips to getting your maximum tax refund. You are entitled to claim deductions for some expenses, as long as you have spent the money yourself and it has not been reimbursed. Clothing & Laundry expenses – Including purchase of occupation specific clothing, uniforms, protective clothing and cleaning of these items. Tools and equipment – If you purchased tools for work or your employer purchased tools for you and you paid them back. Medicare Levy Exemption – You don’t have to pay the Medicare Levy or the Medicare Levy Surcharge because you are not eligible to Medicare. Other Deductions – Including union expenses, over time meals, personal super contributions and more. An accountant will be able to help you get your maximum refund – their professional fee is also a tax deduction.